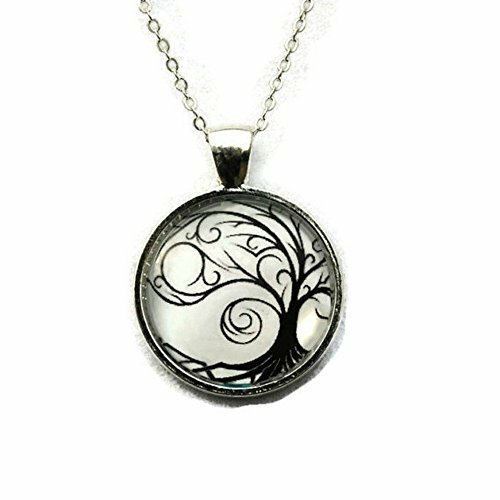 Our Tree of Life Black and White Silhouette connection symbolizes family, love, and nature . This One inch glass dome circle pendant in a silver plated bezel tray. Necklace comes with a 18 inch silver plated rolo chain. Comes in a blue sheer organza bag ready for gift giving. 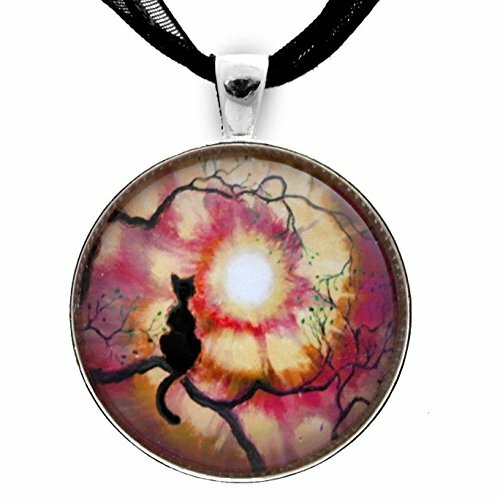 "Black Cat Silhouette in Tie Dye Sunset" The silhouette of a cat on a tree branch, in a tie dye sunset of gold and rust orange. Offered as a handcrafted pendant from artwork by Pacific Northwest Artist Laura Milnor Iverson. Pendant size: 1 1/4" or 30mm round (not including the bail, which is the loop that fits over the necklace). Material: Archival print topped with a glass cabochon. For the setting, silver plating on zinc alloy base metal. 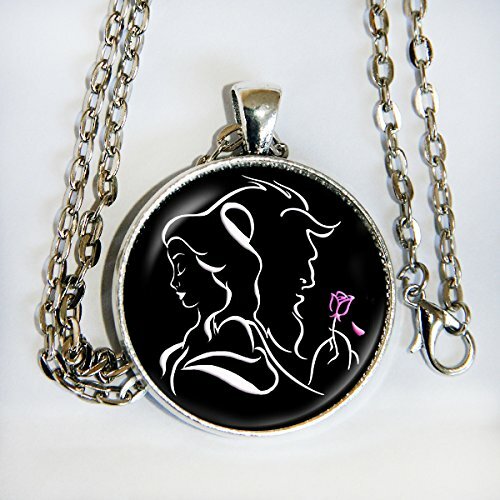 A black ribbon necklace is included so the piece is ready to wear. These have an extender chain that adjusts from approximately 16 1/2" - 18", closing with a lobster claw clasp. Ships in an organza drawstring bag with a signed Certificate of Authenticity. Please note that this wearable art is not waterproof. 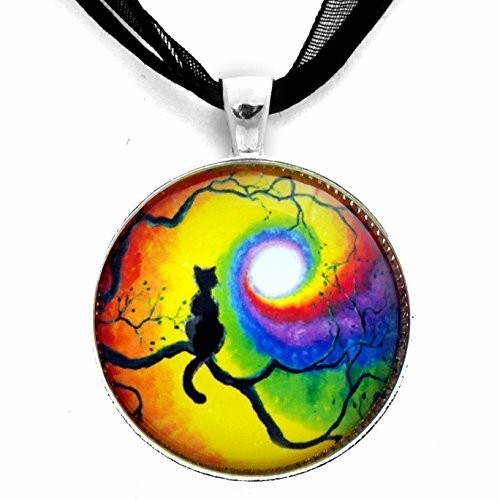 "Black Cat Silhouette in Rainbow Swirl" The silhouette of a cat gazing at the full moon, the chakras swirling around. A lovely meditation in rainbow colors. Offered as a handcrafted pendant from artwork by Pacific Northwest Artist Laura Milnor Iverson. Pendant size: 1 1/4" or 30mm (not including the bail, which is the loop that fits over the necklace). Material: Archival print topped with a glass cabochon. For the setting, silver plating on zinc alloy. A black ribbon necklace is included so the piece is ready to wear. These have an extender chain that adjusts from approximately 16 1/2" - 18", closing with a lobster claw clasp. Ships in an organza drawstring bag with a signed Certificate of Authenticity. Please note that this wearable art is not waterproof. 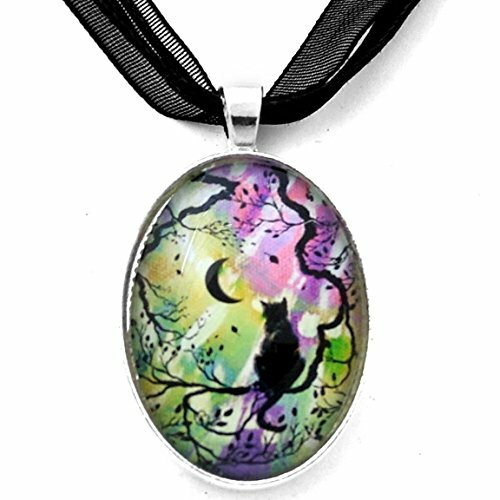 "Cat in Aurora Borealis" A black cat gazes at the new moon. Cherry blossoms light on the tree branches. This surreal landscape, in shades of green, purple and pink, was inspired by the aurora borealis. Offered as a handcrafted pendant from artwork by Pacific Northwest Artist Laura Milnor Iverson. Pendant size: 7/8" x 1 1/4" or 22mm x 30mm (not including the bail, which is the loop that fits over the necklace. Material: Archival print topped with a glass cabochon. For the setting, silver plating on zinc alloy base metal. A black ribbon necklace is included so the piece is ready to wear. These have an extender chain that adjusts from approximately 16 1/2" - 18", closing with a lobster claw clasp. Ships in an organza drawstring bag with a signed Certificate of Authenticity. Please note that this wearable art is not waterproof. 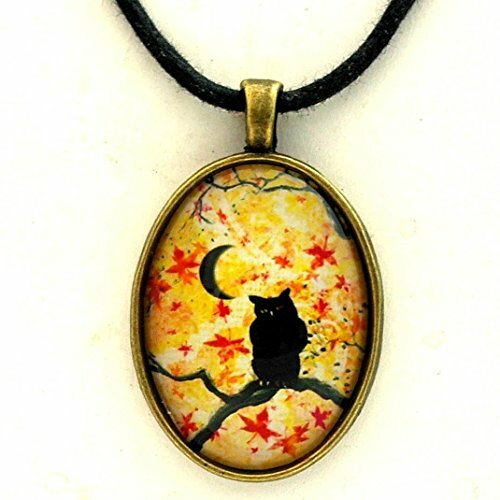 "Owl in Autumn Leaves" The silhouette of an owl beneath a new moon, on a yellow background with dancing orange autumn leaves. Offered as a handcrafted pendant from artwork by Pacific Northwest Artist Laura Milnor Iverson. Pendant size: 7/8" x 1 1/4" or 22x30mm (not including the bail, which is the loop that fits over the necklace). Material: Archival print topped with a glass cabochon. For the setting, antique bronze tone finish on zinc alloy. A 20" black cotton cord necklace with a hook and eye clasp is included--a great unisex style. Ships in an organza drawstring bag with a signed Certificate of Authenticity. Please note that this wearable art is not waterproof. 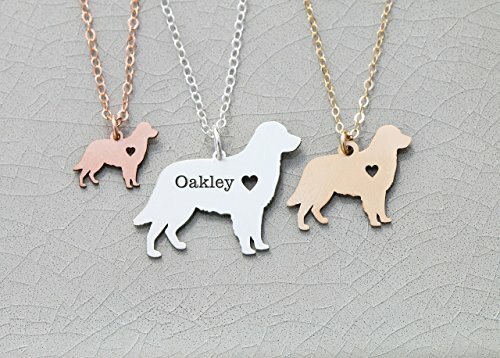 Golden Retriever dog necklace golden gift for dog mom in 935 Sterling Silver, 14K Gold Filled, or 14K Rose Gold Filled, with personalized engraving by IvyByDesign.Model is shown wearing an 18" - Silver chain with a Classic 1" (25.4mm) pendant.-------------------------------------------PRODUCTION TIMEShips in 1 Business Day!-------------------------------------------PRODUCT FAQsSilver Option: 22 Gauge 935 Sterling Silver pendant, in a size of your choice, with matching chain935 Sterling is 7x more tarnish resistant than 925 Sterling!Gold Option: 22 Gauge 14K Gold filled pendant, in a size of your choice, with matching chainRose Gold Option: 22 Gauge 14K Rose Gold filled pendant, in a size of your choice, with matching chain-------------------------------------------ENGRAVING FAQsAdd a personal touch! In the Personalization dropdown, tell us a name, date, or short phrase to engrave. 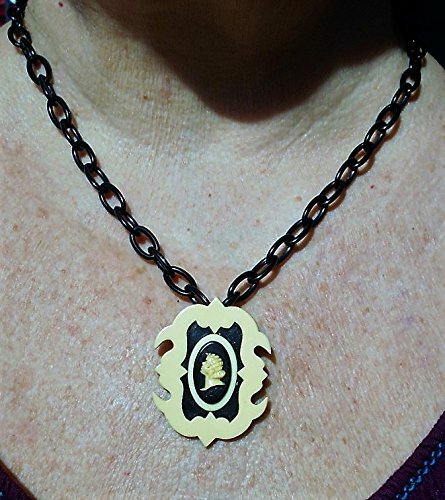 The max character lengths are shown there.We cannot engrave on both the front and back.Engraving is not referring to the heart - the heart is cutout. 1920s Lovely Art Deco Vintage Camphor Glass with Black Cameo Silhouette Sterling Pendant & 17" Necklace. Extender Available marked Sterling on clasp. 2" extender Available for $2.50 just adjust option button. This camphor glass has a screw in focal like many of the camphor glasses. 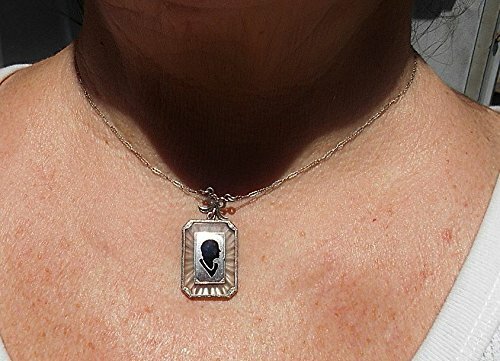 Great Antique Sterling 1"x 3/4" Pendant with silver Rectangular Black silhouetted Cameo, marked Sterling on clasp. Darling Bow Bail measures 1/2" x 1/2". Other items in pictures I also listed today! :>). If you would like a 2 1/2 sterling extender with for $4.00 additional, just adjust options dial.